This probably won’t surprise readers, but when I started looking to buy a significant piece of jewellery last year, I wanted something personal, bespoke and handmade. I don't have anything particular against friendship bracelets; when I was a backpacking teenager I wore them, and my daughters occasionally make me one too. But wearing 10 of them, when everyone else is too is a little sad. Jewellery, in my opinion, should be personal. It’s something you wear next to your skin; that is warmed by it; that you will likely wear more often than any piece of clothing. It’s no coincidence that jewellery is often an heirloom, passed down through the family and therefore a real piece of who you are. Or that there are traditions around jewellery that has to be given as a gift, rather than something you buy yourself. 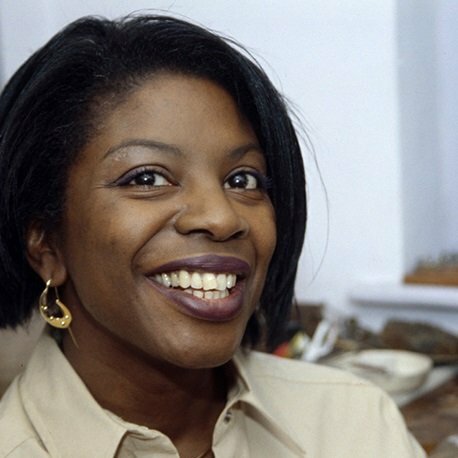 Looking for something unique and personal, I turned to my friend Diana Maynard (above), who makes our Permanent Style cufflinks but spends most of her time on bespoke jewellery commissions. The bespoke process is perhaps harder with jewellery than anything else. The possibilities are endless, and the ideas highly emotional and often very abstract. My rather abstract brief was that I wanted something finely made, but that would age well. That would look practical and natural, but still involve great craftsmanship. 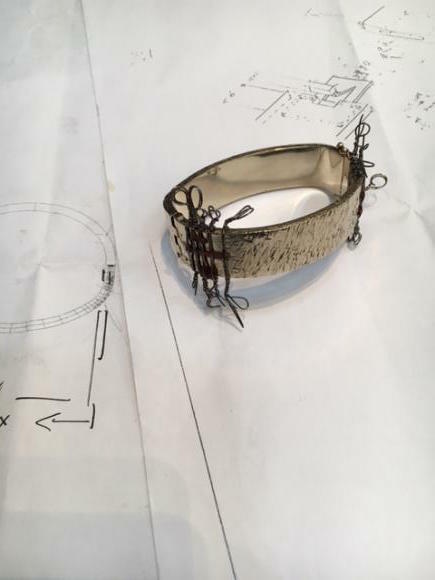 This was not an easy concept, and we went through several sketches before we settled on a jointed, brass cuff. The cuff would be made to the shape of my wrist, so it was personal and echoed the shaping of bespoke shoes and tailoring. It would be made out of brass, as this would tarnish over time (though could always be polished up again if required). Inlaid into that brass would be slivers of wood - irregularly spaced and in varying numbers on each of the four ends. And the wood would also darken and age over the years. 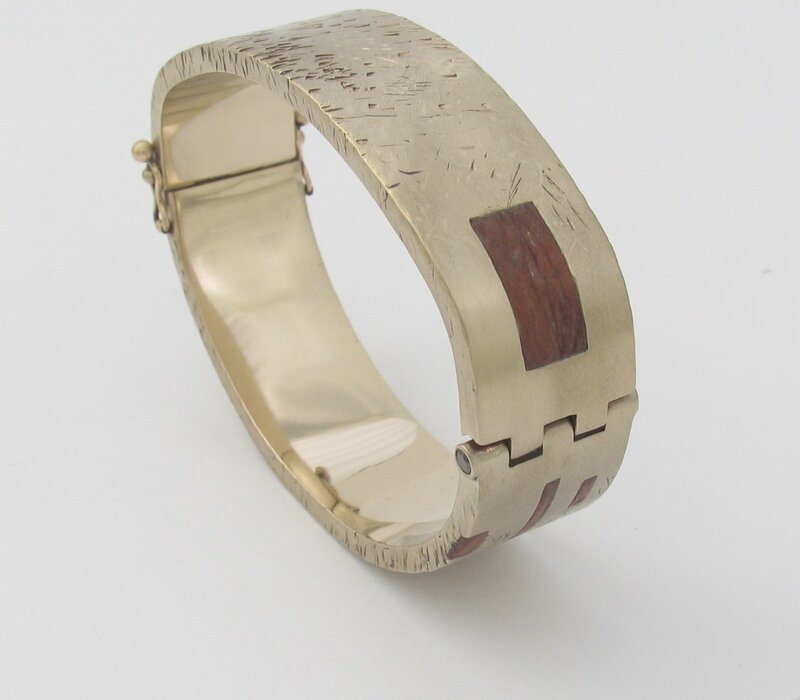 The cuff was beaten by hand, creating a texture around the outside that was beautiful and unique, but also redolent of natural wear and tear. And as final, guilty touch of luxury, there would be tiny diamonds set into the hinge. The design worked well from the start. Once Diana understood what I was aiming for, the texture of the wood we chose and the beaten pattern came naturally. The wood had to be soaked, set in and held to gain the shape of the cuff (see image with black pins above), but that only took a couple of iterations. The hardest part was getting the shape right. Your wrist is flatter on the top than it is on the bottom, but it also changes every time it rotates. 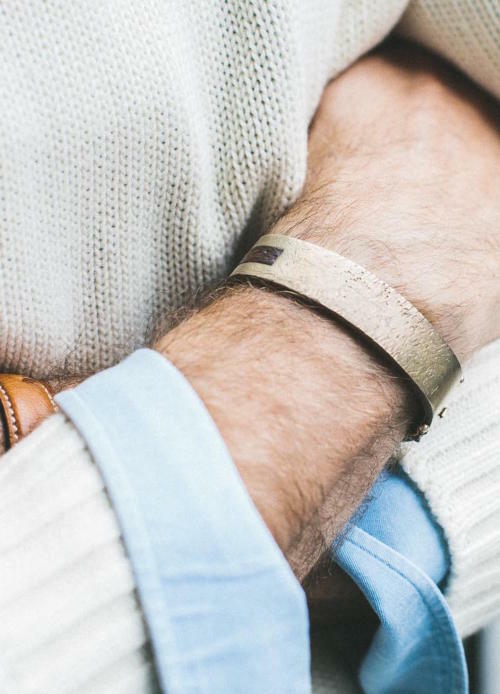 You wouldn't think it to feel your wrist in motion, but the changes are significant. It therefore took rather longer to get the shape right, with several try-on sessions. Thankfully, the result is perfect. On the hottest of hot summer days, my wrist swells and is too big, but the vast majority of the time it fits perfectly - clearly flush with the wrist, but with enough room to move comfortably. I've had the cuff for a few months now, and it's also interesting to see how the materials have aged. The wood has darkened slowly and with subtle variations. The brass as a whole tarnishes quickly and has a particularly nice pattern on the inside. But interestingly, it doesn't darken more within the beaten pattern, which we both expected. The cuff cost £2900. A lot of money, but still relatively cheap in the world of bespoke jewellery. The whole process took just under a year, with several trials and prototypes. And it was this design time, consultations and particularly the handwork that were the biggest aspects of the cost, rather than the materials. I completely understand if others don't like the result. They may well consider it silly, pretentious or overwrought. But I love it. It achieved all my aims, and is a unique, highly personal piece of art that I wear every day. It feels part of me. You can follow the discussion on Bespoke brass jewellery: Diana Maynard by entering your email address in the box below. You will then receive an email every time a new comment is added. These will also contain a link to a page where you can stop the alerts, and remove all of your related data from the site. I personally think it looks great Simon. Clearly a very personal object and undoubtedly a worthwhile investment given the time and money. Diana seems like a great person to work with. I’d love to have a piece of jewelry made in such a way and the idea of it becoming an heirloom is certainly very romantic. Bravo! I wonder if it doesn’t harm white shirt cuffs? Very nice. I like that it looks rugged and masculine for a piece of jewelry. I have never been into bracelets but was thinking about wearing an ID bracelet I have after seeing pictures of Marlon Brando and James Dean wearing them. It looks great, just great. Normally I hate male jewellery but in this particular instance, I think this looks fabulous. Really illustrates the advantage of having something very special made with an artist you trust. In your experience, does brass leave stains on the skin? I had a Tudor Black Bay Bronze watch for a while which I had to get rid of because the bronze metal left stains on my wrist. Wondering if it is the same for brass. Taste is clearly a very personal thing, which is why I don’t think diamonds have a place on the face of a Rolex either. Interested to know about weight though; it looks as though it could be quite heavy? Simon – thIs looks great. It successfully combines a understated style with your customised requirements. Just to confirm, when you say the cuff costs £2,900, is that the cash amount that you paid Diana for the item, or is that the retail price for the consumer on the street for an equivalent item? Both – no discount! 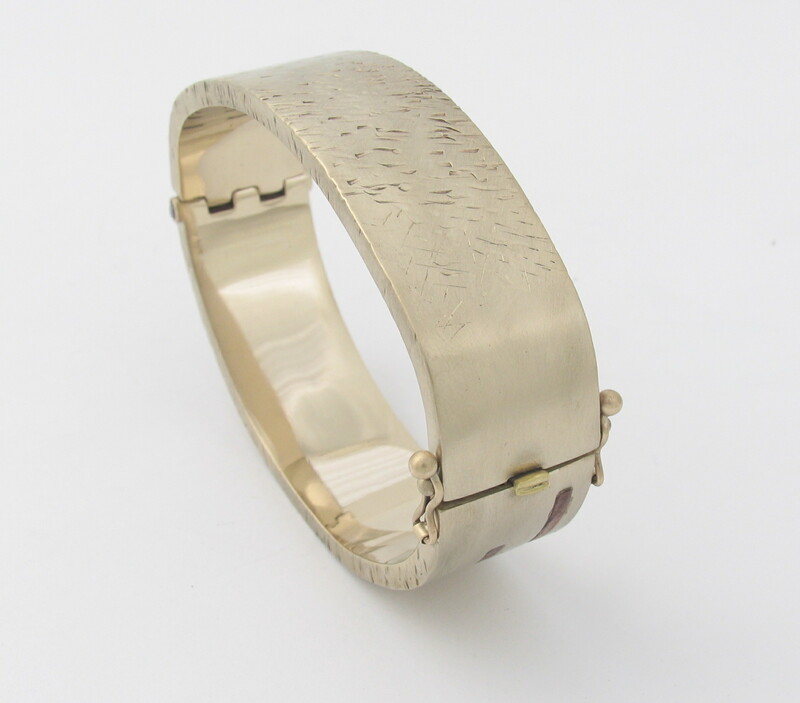 But of course it’s not something that would be available retail; every piece is made and designed bespoke with Diana. What a beautiful piece! It’s really hard to get men’s jewelry that looks suitably masculine, but I think this succeeds very well. Expensive for sure, but not so outrageous in the context of watches (which, let’s face it, are also mostly a piece of jewelry in this age of ubiquitous smartphones) and, like you say, it’s a very personal piece that will last for many years. Absolutely beautiful piece of art work but the term bespoke in regards to anything but tailoring seems daft in my mind. 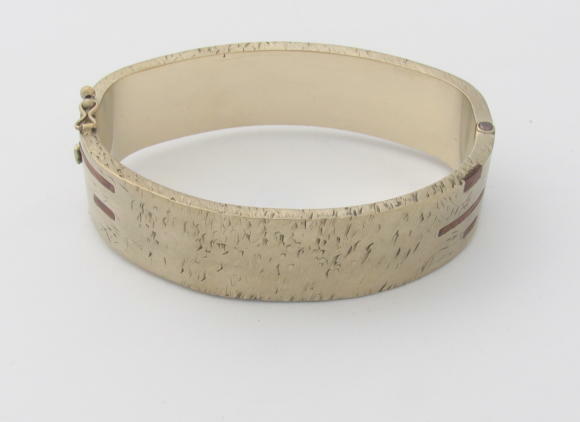 Then again 3K for a brass bracelet is a bit daft too in my mind. So bespoke shoes and shirts aren’t that meaningful either? Shirts are certainly tailoring while shoes are borderline IMO. Besides, nobody said anything about it being meaningful or not just that the raw material, being primarily brass, makes the price point seem a bit obtuse. In any regards, my point is that the term bespoke is thrown about ‘willy nilly’ (bespoke wine,, bespoke jewelry, etc.) these days as evidenced much more eloquently in the NY Times article below. A beautiful piece of work. 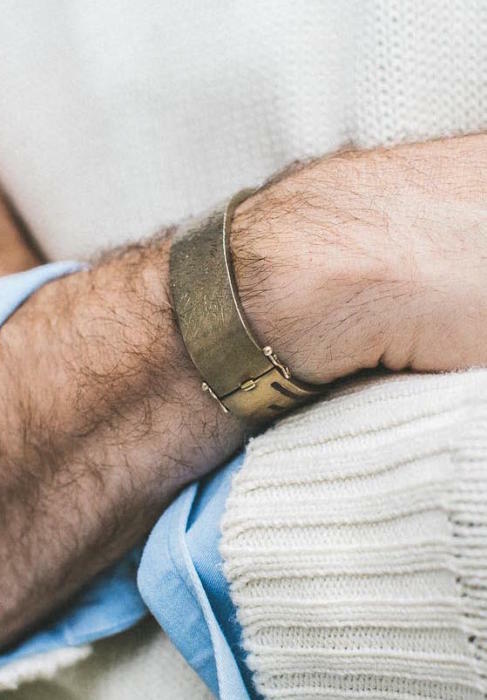 Not my thing at all – I don’t see myself ever wearing a bracelet – but it’s impressive craftsmanship and a very beautiful result. This is trully a piece of art! Thanks for sharing your experience of the whole process. I really love the end result! Weeks ago, I was in a Parisian café and overheard two guys chatting with their wives or girlfriends about what they would like to get as Christmas gifts. And interestingly enough, they both setlled on … Diana Maynard’s cufflinks! interesting jewellery, especially the material. 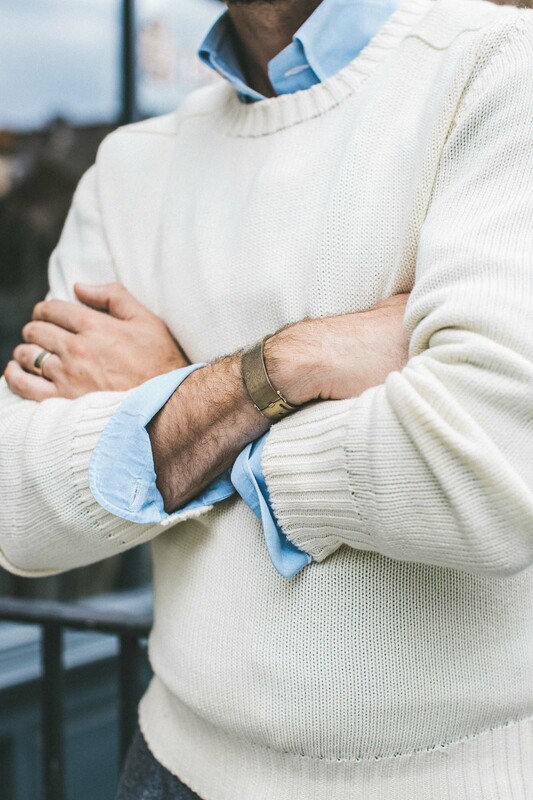 The fitting photos beg me to a question about the combination of the lightblue shirt, the cream sweater and the grey trousers you are wearing. I own a similar sweater from Ralph Lauren, the only difference is its color. It has a rich golden tan color tone. Would you pair it in a similar manner? Or how would you combine it? having read at some point that you have your collars and cuffs fused, the main picture of this article shows why it is such a bad thing. Thanks. That’s just a result of poor ironing – and something that can just as easily happen with a floating lining if not ironed cleanly enough. Also, obviously that can happen on the outside of a floating-lined cuff if not ironed carefully, where it doesn’t on fused. I’m sorry but you obviously don’t know what you are talking about Simon. bubbles like this simply could not be the result of bad ironing………..its fusing breaking down as the chemicals used in the process don’t like detergent. I’m sorry, but you don’t. There is no fusing there, it is just the cloth. There is nothing to break down. With a floating lining I believe you are less prone to the sort of creasing seen in the photo, but creases can occur on both the inside and outside. Sometimes you may see a man whose collar has a small crease at the edge, close to his tie (not a good look). This is the result of careless ironing and can only occur where the lining is floating. Also, the parts of the shirt most vulnerable to creasing that is very difficult to iron out are the seems. The seems on the outsides of fused collars and cuffs are not affected by this. Where the lining is floating, however, this is can be a problem, both inside and out. Whilst fused collars and cuffs can de-bond and bubble, if made properly this shouldn’t happen. Having said that, as I have just had to return some shirts to my shirtmaker to get the cuffs remade for this very issue, I can confirm that it is definitely a risk. Thanks Jay. All right, and I should add that I’ve never had that issue – about 30 shirts from 5 or 6 shirtmakers, and none have had issues with the fusing. I’ve never been a big fan of fusing but I understand the arguments in favour of it, particularly if it can, as appears to be the case with your shirts Simon, result in something which is still fairly soft ( see my comments on the H&K thread about the horrible cardboard stiffness they now produce). On the ironing question, it is quite simple to get a smooth finish on an unfused collar, but it involves a bit of stretching and ironing from the edge of the point inwards towards the centre. Speaking of bespoke items – have you ever considered a “bespoke contest” for your readers and followers? Perhaps this is obvious, or has been mentioned prior (and I apologize if it has), but what about serving up a challenge to all who read your work and find inspiration in your blog? Through videography, poetry, essay, fine art, or short story, entrants can submit an original work that pays homage to the suit. Perhaps what “the suit” means to the individual – how it has not made the man, but enhanced him, and how it is the daily (or weekly) armour that protects us from the slings and arrows of outrageous fortune (or often misfortune) of a life well lived. Or whatever the idea of “the suit” is to you (or you, or you). Your readers could judge the entries – finalists could be selected – and the winner would get a bespoke suit creation at the tailoring house of his (or her) choice up to 5,000 pounds (otherwise, I’d ask for vicuna). If you wanted to limit the tailors we could choose from – why not narrow the focus to Cifonelli, Rubinacci and Huntsman (or A & S), since you already have a strong relationship with them, and this could be a “sort of” promotion for anyone involved…which seems ethical given that you’re not getting the suit. The winner would have to provide his own airfare and accommodations, and could certainly “upgrade” on his own dime if selecting premium fabrics or additional touches to the garment. Already pitched to you by another reader? Thanks – you could have an entry fee of 100 pounds to offset some of the cost – and maybe the tailors would donate the fabric and trimmings. Thank you for continuing to produce articles such as this one which push the boundaries of the possibilities of bespoke products and are also informative to anyone wanting to try something similar, but not necessarily knowing where to start! I have a slightly unrelated question: what is the jumper you are wearing in the photos? It’s from Anderson & Sheppard. Cream cotton. More a summer piece I guess.